Discover out-of-the-way places like Church of St. George and Gorica Zoo. Church of the Assumption and Saint Nicholas Chapel will appeal to history buffs. 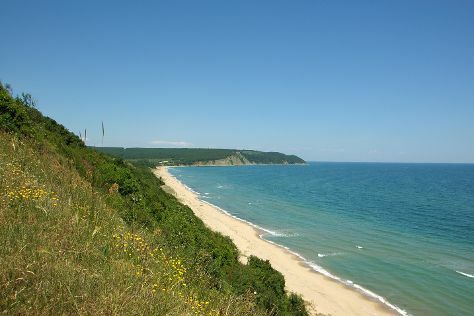 Explore Sunny Beach's surroundings by going to Sozopol (Kavatsite Beach & Ravadinovo Castle), Golden Sands (Aquapolis & Hotel International Casino) and Irakli Beach (in Obzor). Plan for a day of cool, family-friendly fun on the 25th (Thu) at Aqua Paradise Ltd. And it doesn't end there: cool off at Action Aquapark, contemplate in the serene atmosphere at Monastery of Saints Constantine and Helena, explore the ancient world of The Church of St. John Aliturgetos, and admire the landmark architecture of Church of Christ Pantocrator. To find maps, other places to visit, traveler tips, and more tourist information, use the Sunny Beach trip generator. If you are flying in from United Kingdom, the closest major airports are Burgas Airport and Varna Airport. Expect a daytime high around 25°C in May, and nighttime lows around 13°C. Finish up your sightseeing early on the 29th (Mon) so you can travel back home.